DemandLab, an agency that specializes in marketing automation, sales enablement and creative content, developed an interactive, responsive infographic that won a Killer Content Award for their client, Ipreo. DemandLab today announced that an interactive infographic created for their client Ipreo, won a Killer Content Award (KCA) in the Short-Form Content category. The KCAs, presented by the Demand Gen Report—the publication of record for B2B marketing professionals—recognize organizations that have raised the bar in content marketing strategies and campaigns. The award-winning piece was developed for Ipreo, a provider of capital-market intelligence, data, and technology solutions, to create more awareness for iLEVEL, its data-management platform for private capital markets. Ipreo PCM, the firm’s Private Capital Markets division, wanted to spark a conversation among private capital market participants—their target market—about the risks involved in managing financial data with spreadsheets alone. “Risky Business: What Private Capital Firms Need to Know about Using Spreadsheets for Portfolio Monitoring” collected research from a variety of authoritative sources and turned the data into a compelling visual narrative about the limitations and little-known risks. The piece was based on a pre-existing text-based asset that performed reasonably well, but Ipreo and DemandLab speculated that by repurposing the content into a fully responsive and interactive format, they could reach a wider audience and generate deeper engagement. When the infographic went live, it generated a 100 percent spike in traffic to the Ipreo PCM website. In the months that followed, it continued to generate a significant increase in new and returning traffic at 33 percent and 10 percent, respectively. Engagement metrics such as the time spent on site and the number of pages viewed per visit also rose by 60 percent and 70 percent, respectively. The increased activity resulted in several new opportunities valued at more than $800,000 and directly influenced 63 opportunities with a combined value of more than $6.2 million dollars. 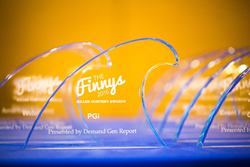 The award was presented to Ipreo PCM at a ceremony that took place at the Fairmont Scottsdale Princess in Scottsdale, Arizona, during Demand Gen Report's B2B Content2Conversion Conference. There were over 200 submissions to this year’s awards and other winning companies included Dell, American Express, Blackbaud Inc. and Oracle Marketing Cloud. The award-winning infographic can be viewed at http://pcm.ipreo.com/spreadsheet_errors_infographic. Founded in 2009, DemandLab specializes in marketing automation services centered on demand generation, digital content, lead lifecycle strategy and CRM. With a focus on the innovative use of marketing automation and CRM platforms, DemandLab applies industry-proven best practices along with proprietary methodology to optimize marketing efforts and demand generation. The company also offers MAaaS™ (Marketing Automation as a Service), a new service model that brings the benefit of marketing automation to businesses that are unable to support the traditional, in-house ownership model. Learn more at http://www.demandlab.com.